Celebrating & Preserving the Ozarks! Join Editor-in-Chief Joshua Heston along with StateoftheOzarks Publisher Dale “Elias Tucker” Grubaugh (sitting in for Ethan) to talk about Talking Rocks Cavern, the Gillioz Theatre, as well as some Silver Dollar City memories. Correction note: At 10:04, Josh Heston mistakenly calls actor Irene Ryan Irene Dunne. Podcast Partners: Shepherd the Musical: Rediscovering America’s Story, Stafford’s Barber Shop & Shave Company: The Place for Men in Downtown Branson, and Taney County Health Department: Creating Opportunities for Healthy Lives in Our Community. 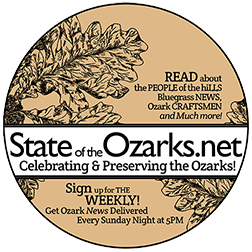 State of the Ozarks Inc.